"My father always said, working for somebody else never amounted to anything. You have to be an entrepreneur." The Gill Center for Biomolecular Science (GCBS) at Indiana University, Bloomington, was established to advance understanding of complex neurological processes and to train the next generation of molecular neuroscientists. Interdisciplinary collaborations at IU include the Departments of Biology, Chemistry, Physics, Psychological Brain Sciences, and Neuroscience. Traditionally trained scientists have made major contributions to modern neuroscience. Yet, training the next-generation of researchers requires an even greater emphases on interdisciplinary approaches, modern diagnostics, instrumentation and computer systems. GCBS is organized to facilitate and incentivize such emphases. GCBS is located in the newly opened (2009) 65,000-square-foot multi-disciplinary science building, MSB-II. 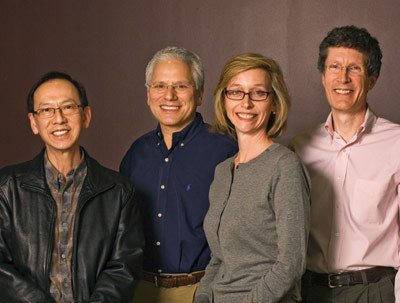 The endowed Gill Chairs at the GCBS (L to R): Cary Lai, Richard DiMarchi, Andrea G. Hohmann & Ken Mackie.